Christmas and New Year Parties are what people are looking forward to now! However, many of us also worry about the diet irregularities during Christmas Parties. Among these people are special health needs people such as diabetics and people having high blood pressure as well as overweight people who stay on diet for most of the time. All of these people can have fun with food on Christmas and yet be safe in every way. They just need to keep in mind some food combinations and some avoidable eating behaviors. 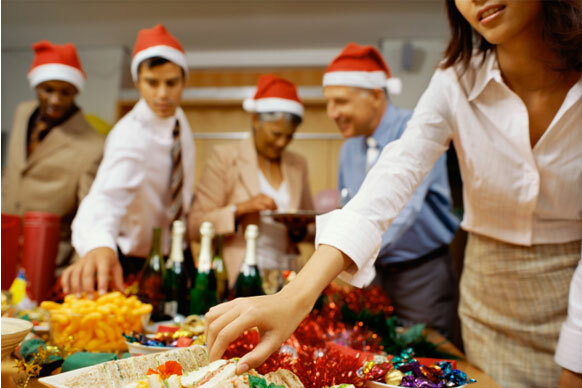 So, here are some diet tips for Christmas parties which are even advisable for other parties all the year round! People having diabetes should watch their food and alcohol portions as well as eat certain special foods along with regular party food on Christmas so that they are able to balance their sugar levels. When having a Christmas party at night, diabetics should have sugar balancing foods during the day. So, have bitter gourd juice in the morning and include oats, fenugreek, soya etc. in your day meal. Have small portion of food for dinner party and try to include more proteins like chicken, fish etc. When having alcohol, keep a check on yourself. Two servings are good enough for diabetics. To dilute the effect of alcohol, have a glass of water after a drink. Alternatively, have salad with a hung curd dip which also dilutes the effect of alcohol. People with high blood pressure should try to drink a lot of water and have a lot of onion and garlic in the diet. Have a lot of potassium loaded food as a regular habit, especially prior to Christmas parties. Potassium along with sodium regulates blood pressure. Good sources of potassium include fruits like cantaloupe, bananas, kiwi-fruit, oranges, watermelon and dried apricots as well as vegetables like potatoes, spinach, and zucchini. When in a Christmas party, try to have more of foods having calcium like low-fat dairy products, soybeans, sardines, salmon, peanuts, walnuts, dried beans, salads having dark leafy green vegetables. Try to have small portions of meat. Instead take portion sizes of vegetables, rice, pasta, and dry beans in meals. Try casseroles or stir-fry dishes having less meat, more vegetables and beans. People on diet know exactly what to eat in Christmas parties- they should make healthful choices to enjoy the pleasures of holiday seasons as well as not to destroy all their yearlong efforts to keep in shape. The first mantra for Christmas diet for overweight and people on diet is to drink lot of water to avoid overeating! Fill your plate in a Christmas party with healthy alternatives and try to eat very slowly. Have more of seafood. Raw oysters and fresh seafood are best. They are good in cooked form too. Try to avoid carbohydrates and opt for lean protein. Remove the skin from the chicken or turkey or duck and eat breast meat which is lowest in fat. Drink one glass of water after every glass of alcohol. Choose wine over high fat eggnog. You can even mix half glass of wine with half a glass of carbonated water for a low-cal wine. Avoid deep-fried appetizers. Choose to have shrimp cocktail as a low-calorie appetizer. When choosing a dip, go for cocktail sauce which is much healthier than other fatty dips. Eat dark chocolate instead of milk or white chocolate. Its Christmas after all! So, let yourself have some high fat food too like fried cheese sticks, a double fudge brownie, etc. but look out for portions. Have small portions and eat slowly- that’s the most important of the diet tips for Christmas parties! That was all about Christmas diet tips. If you are looking for tips to lose weight before Christmas, read How Do I Loose Pounds Before Christmas?